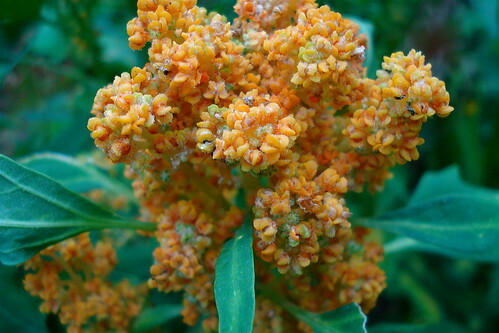 Quinoa (pronounced /ˈkinwɑ/ KEEN-wah or /ˈkinoʊə/ KEE-no-uh, Spanish quinua, from Quechua kinwa) is a species of goosefoot (Chenopodium) grown as a crop primarily for its edible seeds. It is a pseudocereal rather than a true cereal as it is not a grass. Its leaves are also eaten as a leaf vegetable, much like amaranth, but the commercial availability of quinoa greens is currently limited.